Chennai: Students and Research Scholars of Indian Institute of Technology Madras have won several laurels at Gandhian Young Technological Innovation (GYTI) Awards 2017. 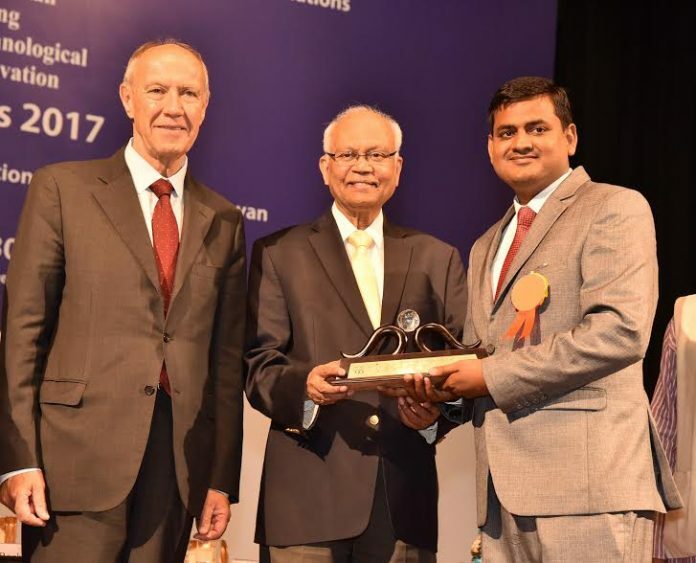 Dr. Vikram Singh, former Research Scholar in the Department of Chemistry, IIT Madras, won the BIRAC GYTI Award for his project ‘White Light Emission from Vegetable Extracts’ (http://gyti.techpedia.in/project-detail/white-light-emission-from-vegetable-extracts/7414). He was guided by Prof. Ashok Kumar Mishra, Professor, Department of Chemistry, IIT Madras. Dr. Vikram Singh says, “Receiving the prestigious GYTI Award at Rastrapati Bhawan was a big honour for me and I am delighted. I will be using the Rs 15 lakh award grant to continue my research on white light emitting material from plant sources. I plan to research on RGB Emitting Carbon Quantum Dots from Vegetables/Fruits extract”. The BIRAC-SRISTI award for biotechnological/medical/healthcare innovation is given to a technology having the potential to reach the masses and/or address a felt social need or making it extremely affordable compared to the available solution. Up to fifteen of the selected innovations may be given a grant of Rs.15 lakh each and another hundred ideas may be granted Rs. 1 lakh each for taking the idea forward. Anupam Chandra and Ramesh Kumar (Project Associate) for their project entitled Portable Geo-specific Water Filtration Bottle. They were guided by Prof. T. Pradeep. Arvind Pujari, Tanay Garg, Shashwat Jain, Kushal Kumar Reddy DVSS and Subham K Sahana for their project entitled A Mechanism for Toilet Seat Sanitation. They were guided by Prof. Anil Prabhakar. Avisek Barla, Abrar Ali Khan, Sameer Sharma, Vijay Anand and Nitish Kumar Singh for their project entitled Affordable Paper Microfluidic Device for Blood Glucose and Cholesterol Detection. They were guided by Dr. Vignesh Muthuvijayan. Mallikarjunachari G. for his project entitled Design of a Mechanical Device (Nanorobot) for Diagnosis and Removal of Plaque from Human Heart Artery System. He was guided by Dr. Pijush Ghosh. Mannam Naga Praveen Babu for his project entitled Fish-Inspired Propulsion for Remotely Operated Surfaces Ships and Underwater Vehicles. He was guided by Prof. P. Krishnankutty.